Justice Blease has served as an Associate Justice of the Court of Appeal, Third Appellate District since he was appointed by Governor Brown in 1979. He also served as a justice pro tem on the California Supreme Court (1982, 1997, 2005), a former member and Vice Chairman of the California Center for Judicial Education, and a Special Master for the Commission on Judicial Performance (1996). He is a past President and a Master of the Milton Schwartz Inn of Court. 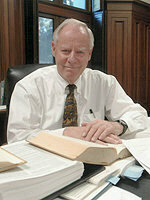 Justice Blease also has been a member of the Select Committee of Advisors, Pacific Law Journal, a consultant to California Civil Appellate Practice, 3d ed., 1996, a moderator of Continuing Education of the Bar programs on appellate review, civil writs, criminal appeals and evidence and a speaker at Sacramento County Bar Committees on Administrative and Labor Law. Justice Blease was a participant in the Appellate Judges Seminar, Advanced Series, Institute of Judicial Administration, New York University School of Law in 1996. He is the author of a paper on the strict construction of statutes which has been delivered to judges and lawyers. Justice Blease is the author of more than 3000 opinions on a broad array of subjects, several hundred of which have been published, including a dozen on water law. Among them are County of Inyo v. City of Los Angeles (1981) 124 Cal.App.3d 1 [pumping of water from Owens Valley], California Trout, Inc. v. State Water Resources Control Board (1989) 207 Cal.App.3d 585 [release of water into streams tributary to Mono Lake], Baldwin v. County of Tehema (1994) 31 Cal.App.4th 166 [county regulation of groundwater] and Central Delta Water Agency v. State Water Resources Control Board (2004) 124 Cal.App.4th 245 [jurisdiction of state water board]. He has been an annual participant in national conferences for water masters and judges since 1999. Justice Blease received his undergraduate (1952) and law degrees (1955) from the University of California at Berkeley where he later taught undergraduate courses in freedom of speech and the logic of argument. Before appointment to the bench he represented civil rights organizations and had a varied practice in public law. His clients included the California Teachers Association, the State Superintendent of Public Instruction, the County of Placer, the League to Save Lake Tahoe and public employee organizations. He argued some forty cases before the appellate courts of California, Nevada and the federal Ninth Circuit Court of Appeals. Justice Blease was born in 1929 and is married to Barbara Blease, an advocate for persons with disabilities. They frequently hike in the Sierra mountains during the summer. They have two grown sons Christopher and Brian, one a businessman and the other a biologist.